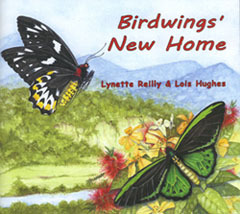 Lois and Lynette at the book launch. Is there an incurable condition known as being ‘insecticidal’? if so, I think I have it! Being infected with this ‘bug’ from childhood, I have always been fascinated by the bush and its many creatures. My interest became more focused on invertebrates after joining the Butterfly and other Invertebrates Club in 1995. 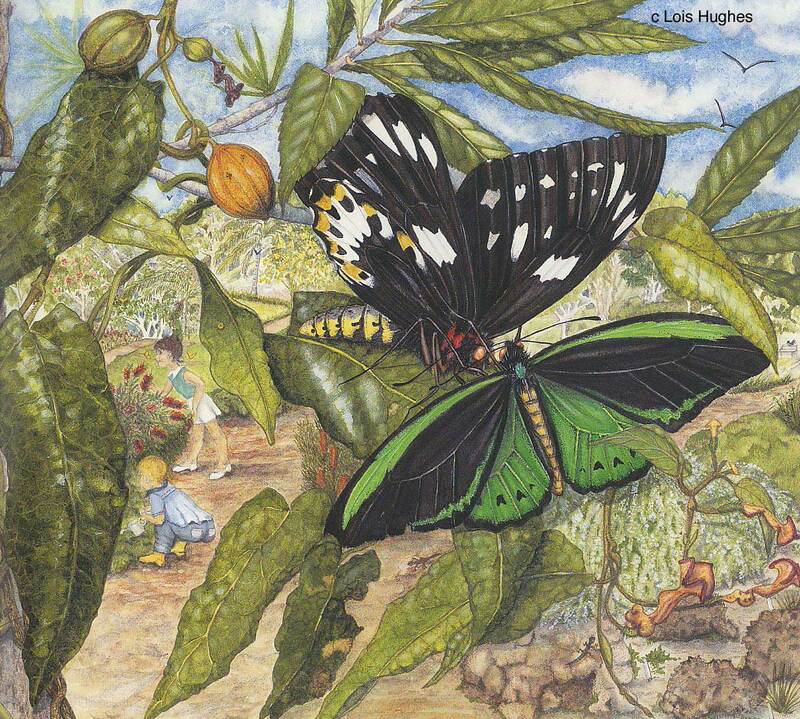 Art has always been something I did – at school, Art School, a short time in advertising and in later years, the Botanical Artists and presently with the Qld Wildlife Artists’ Society. My botanical and insect illustrating skills have been developed and refined, first by illustrating BOIC’s newsletter with black and white drawings. Now it has grown into a full colour magazine Metamorphosis Australia, I am required to produce a cover painting of the main ‘creature’ featured each quarter. Artwork for a poster, book covers, a Limited Edition Print and giclee prints of my originals, was well as butterfly greeting cards, have all resulted from these combined interests. The abundant wealth of plant, bird and insect life on our beautiful Mt. Cotton property continues to capture my imagination. But the fragile beauty and the sheer improbability of the metamorphosis of the butterfly and the deeply moving spiritual journey God has led me on as I study their lifecycles fires my passion, both to capture these amazing creatures on paper and to protect and replenish the habitat that sustains them. 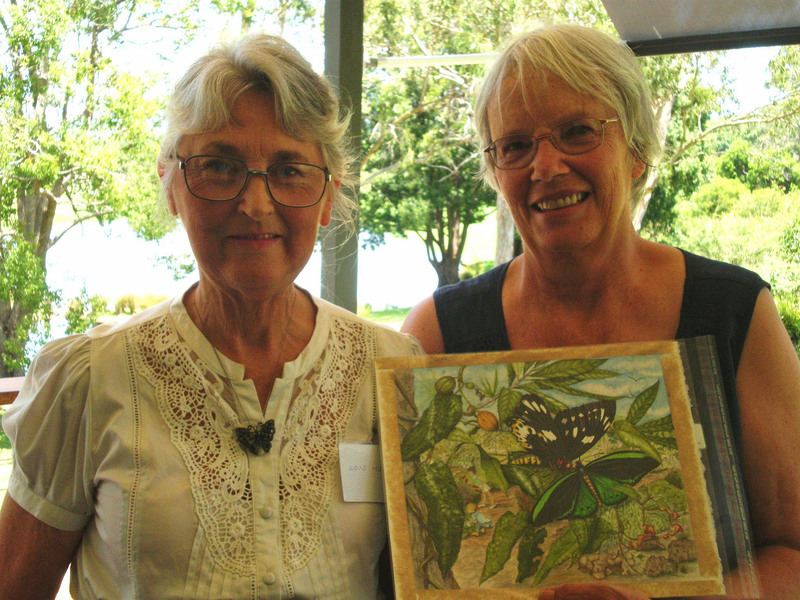 My involvement with the Richmond Birdwing Conservation Network has led to the planting of their special vines for this endangered butterfly not only on our property but throughout the area. We join a dedicated network from Northern NSW to Maryborough in Queensland and inland to Toowoomba who are establishing corridors of vines providing flight paths from known brreding sites so these butterflies can re-colonise their former territory. Birdwings’ New Home is also part of this venture, to introduce the younger generation to the plight of this jewel of the rainforest and the part we can play in its recovery. Note: A number of original paintings done for the book are for sale e.g. ‘Flying over the treetops’, ‘Garden with birdbath’, ‘Dutchman’s pipe biff’, ‘Spider’s web’. Prints of some of the paintings are also for sale e.g. 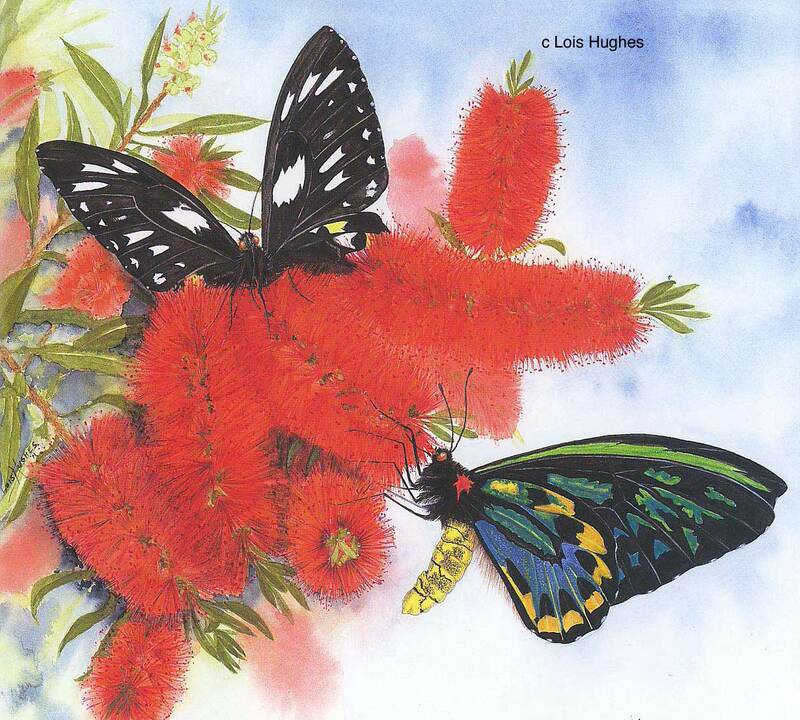 ‘Feeding on the bottlebrush’, ‘Daisy garden’, ‘Dutchman’s pipe biff’. Originals are $200 each (including postage). Prints are $65 each (including postage). Please phone Lois on (07) 3206 6229 for picture orders or more details.